I’ve been a fan of Intellij IDEA for years, since a friend introduced me to it. It’s by far the best Java IDE around (this coming from a guy whose IDE used to be a combination of Emacs, “find” and “grep”). I (or my properly, my employer) have gladly paid each year to get the latest version of this awesome tool, along with its excellent tech support. 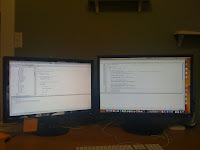 Yes, that’s a picture of the Intellij editor stretched across two LCDs. It turns out there is a feature request for this in their tracker. Can you believe that it’s been languishing there for over four years? If you’re an Intellij user, please create yourself an account on their tracker and vote for this issue.